In other GW2 news, I finally buckled down and completed the Heart of Thorns expansion story. Which is a bit weird, because I never finished the main GW2 story in all the time I’ve played the game, but whatever. The primary impetus was not necessarily seeing any kind of plot resolution, but because you can unlock an Ascended weapon at the very end. Okay, yeah, this is cool. The story experience of GW2 is interesting in general. Unlike a lot of other MMOs, your character is fully voiced and actually present at all the story moments that occur. While for some people this can pull them out of the game, I’m more than fine with it. In fact, it was oddly soothing for me, as the Commander always knows what other people are talking about, even when I do not. I mean, of course that is the case, but sometimes there can be large gaps inbetween plot points simply because you get swept up in some Map event chain. Well… at least it wasn’t just me. Indeed, I was recently wandering around unlocking stuff when I got swept up in a Mordremoth battle. 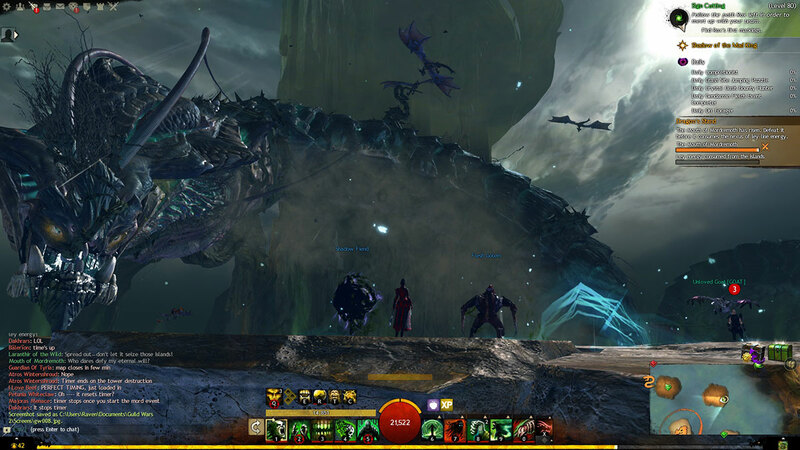 This is technically the big dragon you are trying to kill in the expansion, so it was a bit weird engaging it before I had even reached the point story-wise when that was possible. The fight was crazy expansive, and I was forced to learn the mechanics on the fly, as it featured many instant-death mechanics. Ultimately we were successful, and I got a lot of shiny loot that was immediately thrown in the garbage, because Good Game Design. Then I went back did some quests to find my friends kidnapped by Mordremoth, so I could figure out a way to kill him. Those are real rocks you can stand on, by the way. Along the way, I encountered a lot of bugs. Out in the open world, bugs can be super frustrating, but at least you can do something else. When you’re trying to complete a story though, getting force-disconnected at the end of a 25-minute story instance means starting all over. And there’s not any loot along the way, so it’s a total loss of your time. So while I appreciated the cinematic experience, this is not a exposition vehicle I want on the road. 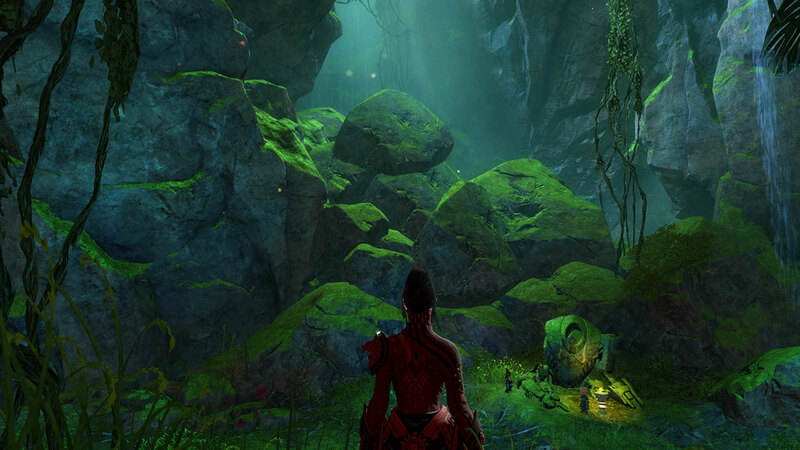 I’m wrapping things up with Heart of Thorns, but there is something I definitely cannot say enough about GW2: it evokes a sense of space and depth and environment better than any other game on the market. I did find some invisible walls while I was messing around with mounts – which weren’t implemented until the next expansion – and all of the maps are sharp rectangles… but man. Not just the skyboxes, but the level of detail on the terrain is a sight to behold. 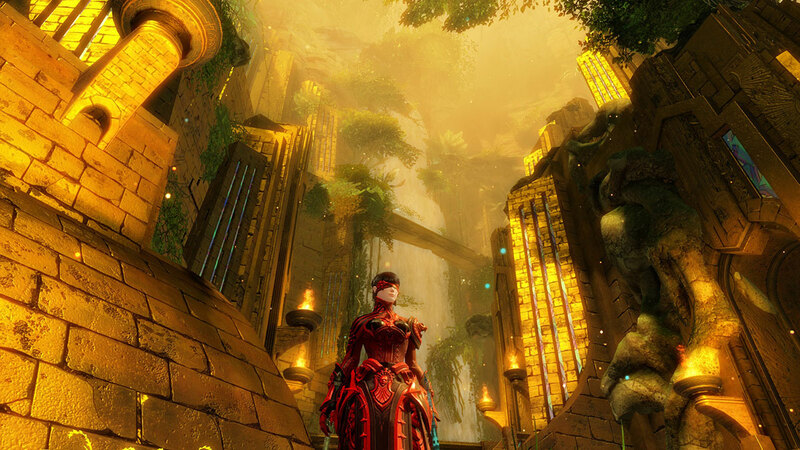 I would take any random corner of Tyria against the best, staged screenshot in WoW any time. 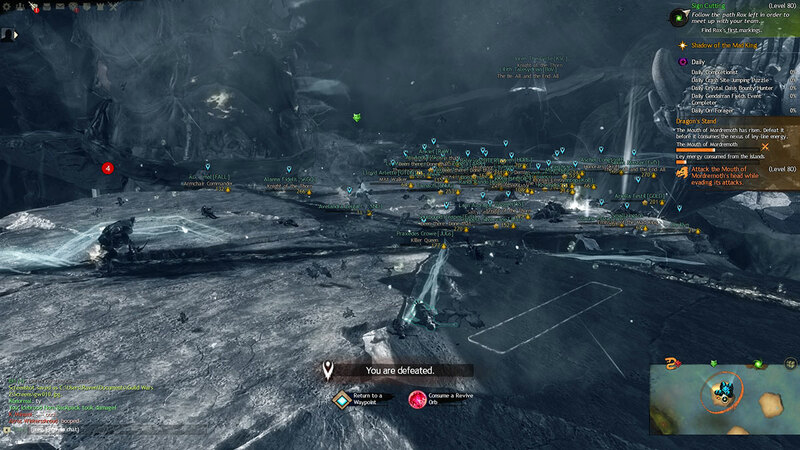 Posted on November 9, 2018, in Guild Wars 2 and tagged Beauty, Explicit Schedule of Villainy, Guild Wars 2, Instant Death, Sense of Space, Skybox. Bookmark the permalink. Comments Off on Heart of Thorns Complete.